Founded in 1998, Pioneer Pole Buildings serves residents in Pennsylvania, Maryland, New Jersey, Delaware, Virginia, West Virginia and New York. Since opening its doors, the company has worked hard to establish a reputation for supplying buildings of the highest quality at affordable prices. 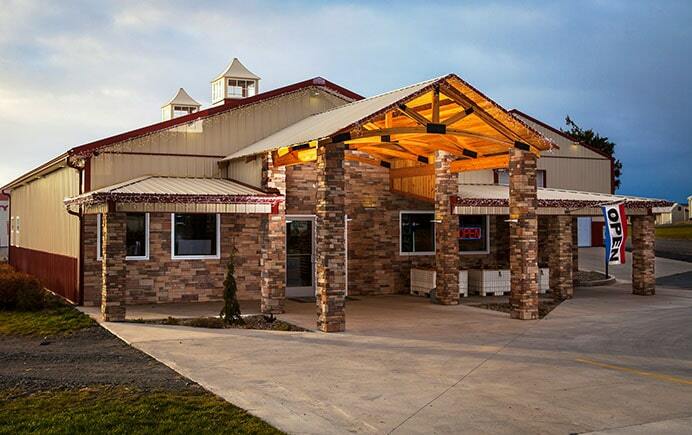 Pioneer aims to provide their customers with the most structurally sound buildings and uses the highest quality materials when producing their buildings. What else makes Pioneer stand out in the crowd? All of their buildings are designed to withstand 90 MPH winds. The company has its own experienced construction crew. Every building is designed individually by the company’s engineering department. Each building is built on site. Buildings come with a limited lifetime post and snow warranty. Pioneer has an A+ rating with the Better Business Bureau. The company is a member of the National Frame Builders Association (NFBA). Pioneer’s workmanship is backed by a 5-year guarantee. Pioneer’s steel is backed by a 50-year warranty. What Types of Buildings are Available? 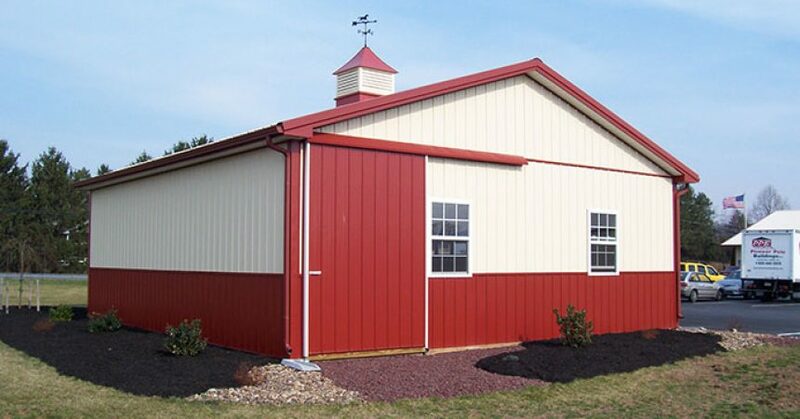 Pioneer offers many different types of buildings in a variety of categories, including: residential, agricultural, commercial, equestrian, gambrel and more. Residential buildings include garages. Both single and multi-car garages are available as well as RV storage buildings. Some garages include overhangs, doors and office space. While you won’t find prefab barn homes in the company’s residential portfolio, they can construct one for you. The company tailor-builds homes to meet the needs of their customers. Many of the residential building plans can also be used for agricultural purposes. 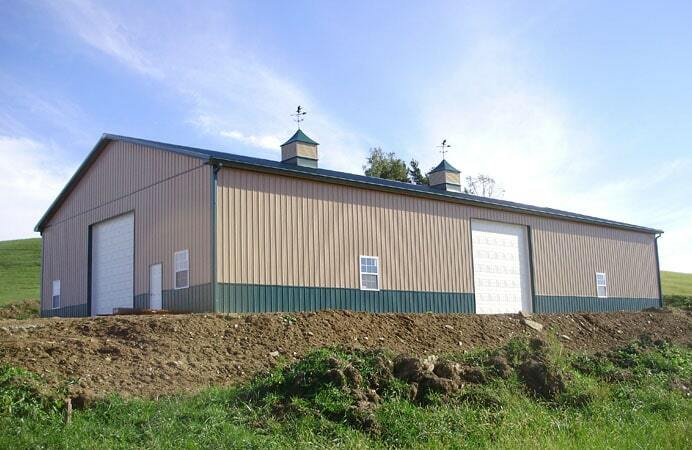 Pioneer also offers other building plans that can meet the needs of your farm, from a modest 24′ x 32′ building to a massive 80′ x 120′ building. From repair shop garages to commercial stores and warehouses, Pioneer offers a number of commercial building plans to meet your commercial needs. Customized plans can also be created if your commercial venture has unique requirements. 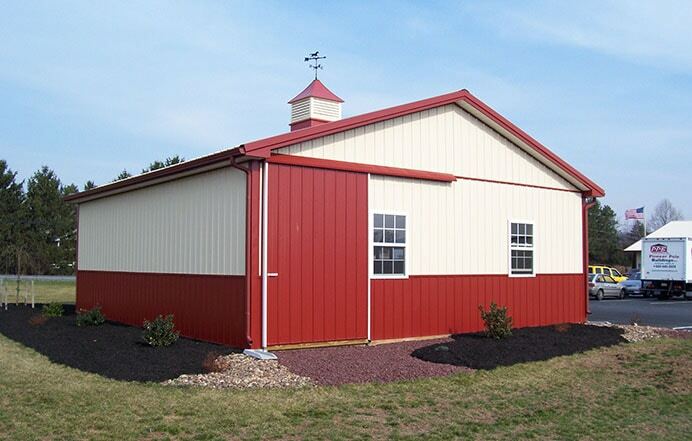 A wide range of equestrian building plans are available, but you also have the option of constructing your own custom building. 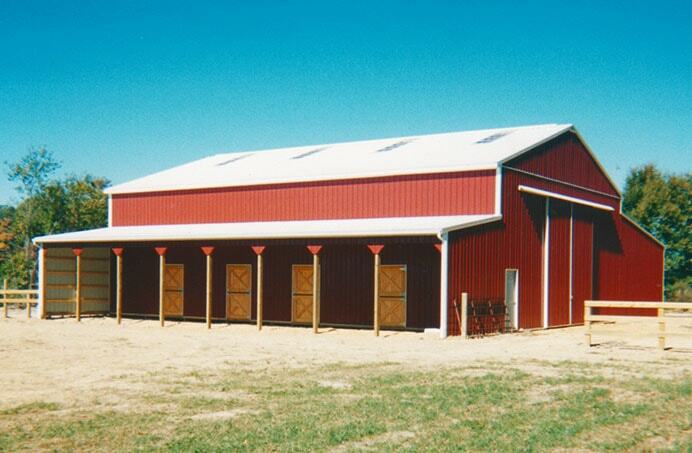 Whether you want a 30 x 40 pole barn or a 40 x 60 pole barn, Pioneer can design and construct a building that suits your needs. 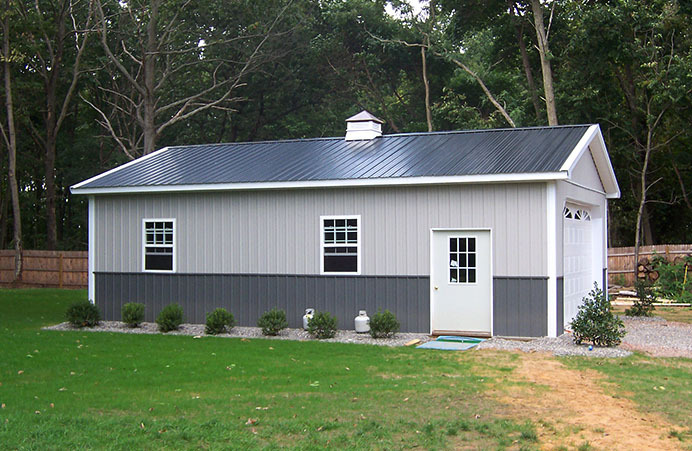 Buildings with vinyl, and board and batten exteriors can also be created. How much will your Pioneer building cost? That depends on the size and the design of the building. Custom designs and larger buildings will naturally cost more. The company’s portfolio provides prices for some building plans. How Are Pioneer Buildings Made? 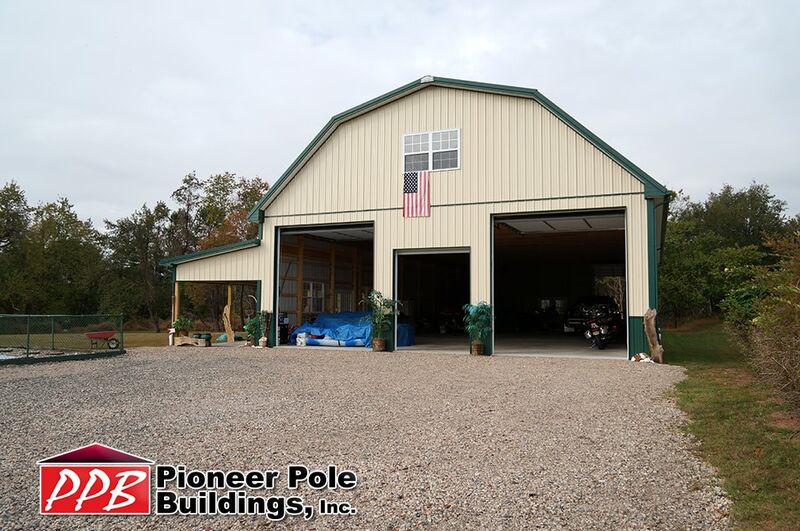 Pioneer pole buildings are built to the highest quality standards. The company’s careful selection of materials ensures that their structures maintain their appearance and functionality for years or decades. All buildings are constructed on-site, and the company has its own team of experienced construction workers who will get the job done right the first time. The posts used in Pioneer buildings are set at least 36″ below the floor line and run to the top of the roof trusses. Each post is one solid column and are set at eight feet on center. Columns can be set closer, depending on where the doors are located. Pioneer uses at least 3000 PSI concrete mix for footings, depending on the design and size of the building. Footings have a standard depth of 36″ from the floor line. Any lumber or posts that come in contact with the ground are pressure treated to a point where there’s a lifetime warranty against decay. Pioneer’s poles are 50% more than lumber supplied by other yards. Any structural wood used by the company will be #1 Southern Yellow Pine MSR (Machine Stress Rated). This is the strongest wood you can buy in the construction industry. Pioneer’s purlins are made with #1 and #2 spruce 2x4s. Purlins are set 24″ on center to keep splitting to a minimum at the connections. The exteriors of Pioneer’s buildings are fitted with the company’s Frontier Panel, which has a limited lifetime warranty. Panels are heat-roll formed and painted to your liking, with 17 colors available. The siding and roof of the building is fastened with weather-tight screws, and trimmed at exposed connections and edges. If you don’t like the Frontier Panel option, you can choose shingled roofing and vinyl siding instead. All roof trusses are set at either 4′ or 2′ on center. Trusses are pre-engineered with loading that far exceeds state building codes. Pioneer offers the strongest roof load in the entire industry. Pioneer offers your choice of overhead, entry and sliding doors. All entry doors are pre-hung, residential grade and made with insulated steel. These doors also have keyed knobs backed by a 10-year warranty, and a post on each side. Overhang doors come with panels that are backed by lifetime warranty. These doors are made with galvanized steel, and feature steel bearing rollers and torsion style springs. Solid doors are available in both split and solid forms, with many sizes to choose from.